When you provision Dynamics 365 Portals, there's a lot of configuration that's already set up so that you can hit the ground running. One of the configuration that's available on the Profile web form is the Contact preferences displayed as check boxes. Usually this is asked to be removed whenever I work with clients as they prefer to have an email only subscription method such as embedding a ClickDimensions Subscriptions page in Dynamics 365 Portals. There's no need to ask how to get in touch with Contact other than email. 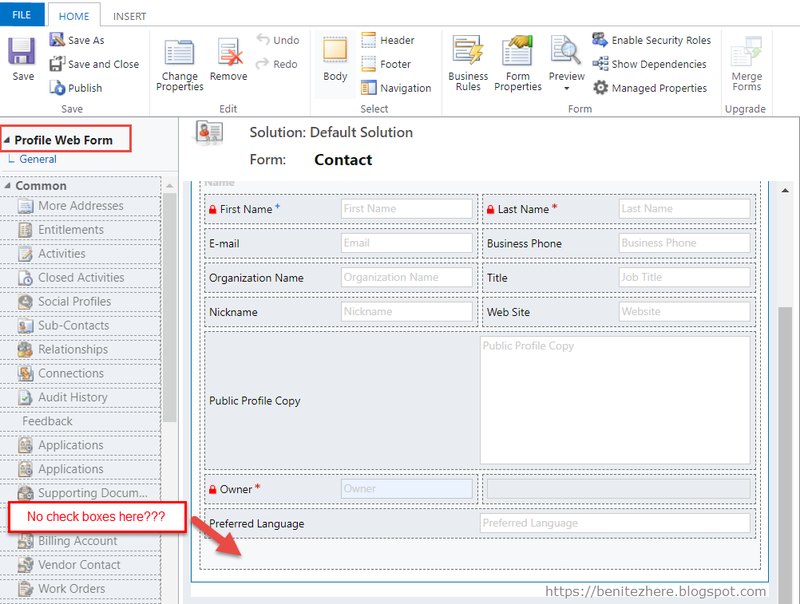 When I first started on Adxstudio Portals I automatically assumed it would be in the Contact Profile entity form however it's not displayed in a section on the form. So how do you it? Well my grasshoppers, in this vlog and blog post I cover how to hide the Contact preferences using in the Profile web form configuration only. Checkout my vlog below. 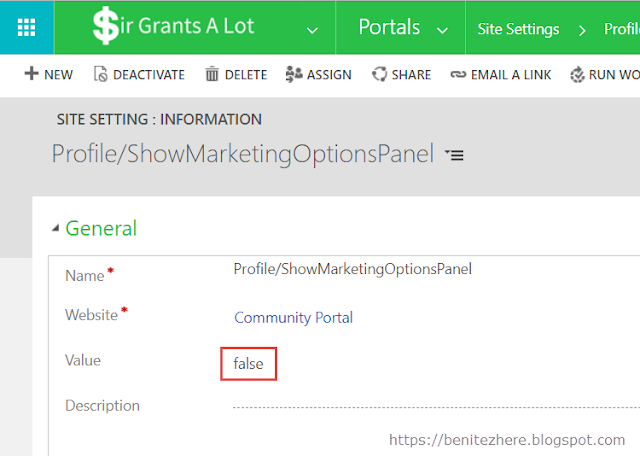 To hide the Contact preferences check boxes, simply update the Site Setting of "Profile/ShowMarketingOptionsPanel" by updating the value from true to false. Refresh the Profile web page in Dynamics 365 Portals and you're good to go. Hooray! 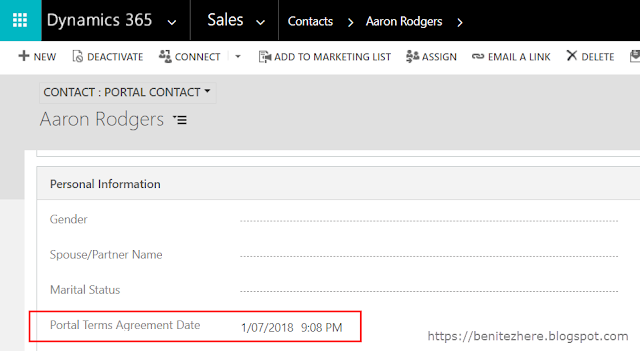 To hide the Contact preferences in the Profile web form of Dynamics 365 Portals, update the Site Setting Record and refresh the Profile web page. Ta-da! Simple and configuration only. For a history of GDPR this article is a good starting point. In 2016, the EU adopted the General Data Protection Regulation (GDPR), one of its greatest achievements in recent years. It replaces the 1995 Data Protection Directive which was adopted at a time when the internet was in its infancy. The GDPR is now recognised as law across the EU. Member States have two years to ensure that it is fully implementable in their countries by May 2018. GDPR is now in effect as of May 25, 2018. What to do if using or considering Dynamics Portals as a platform with customers? 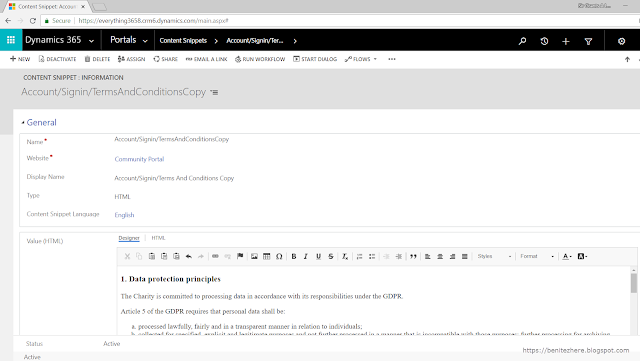 As a baby step towards GDPR in Dynamics Portals, there are new features that can be used to ensure customers as users of the portal to review terms and conditions. Those that pay attention to the Microsoft Experience site will recognize this has most likely stemmed from this one. Now keep in mind that there's still more ground work for your organisation to be GDPR compliant. It doesn't stop with enabling these features in Dynamics Portals. This is simply supporting the law. Even though these features at first glance seem to appear to be applicable for brand new user of Dynamics Portals, the product team has designed it in a way where it can still be presented to existing users. Check out my vlog for a brief overview. There is a Content Snippet record which will be blank by default. This Content Snippet record is Account/Signin/TermsAndConditionsCopy. Once you have your terms and conditions confirmed (and hopefully legally reviewed!) you can enter in the Content Snippet. There's HTML capability so you can include hyperlinks to additional web pages if needed to provide further information to the user. This allows you to change the acceptance statement. This allows you to change the label displayed for the button that allows the user to continue to the site. After entering your terms and conditions in the Content Snippet, you'll want to enable the functionality. As usual, my favourite gem in Dynamics Portals is Site Settings. The Site Setting to update is Authentication/Registration/TermsAgreementEnabled. By default the value will be false. 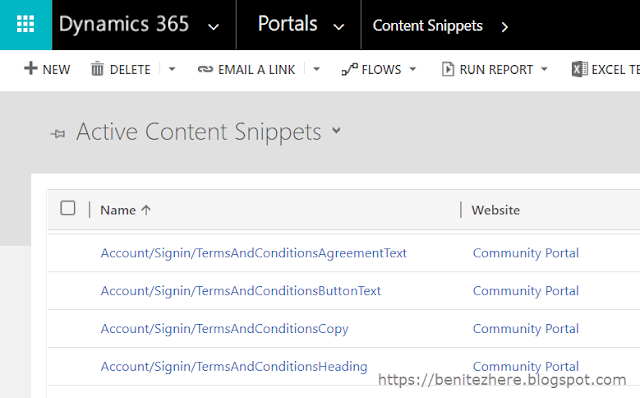 Update the value to true for the terms and conditions functionality to now display in your Dynamics Portals instance. Refresh your Dynamics Portals and create a new account. After submitting your account registration details, voila! The terms and conditions will be displayed and you won't be able to continue unless accepted. Enter Site Setting No. 2. There is another Site Setting (surprised?) that can be updated. This Site Setting is Authentication/Registration/TermsPublicationDate. If you leave this blank then the user will continuously have to agree to the terms and conditions before signing in. If you don't want the user to agree to the terms and conditions every time they sign in, you can enter a GMT value in this Site Setting. Remember earlier how I said the product team designed it in a way where it can be presented to existing users? Users who have not not accepted the terms and conditions by the date and time, will be presented with the terms and conditions before proceeding. I researched online what exactly is the string required for GMT values and came across this handy guideline. Sweet! The next step was turning to Google and checking what time would it be in Melbourne if it was 8am GMT. This converts to 6pm here in Melbourne, Australia. At the time I was doing my vlog, it was past 6pm so this was perfect. The value I entered in this Site Setting was Sun, 01 Jul 2018 08:00:00. When I then logged back into Dynamics Portals using the same user account from earlier, the terms and conditions was no longer displayed. What is stored back in the Contact record? This one I didn't cover in my vlog. 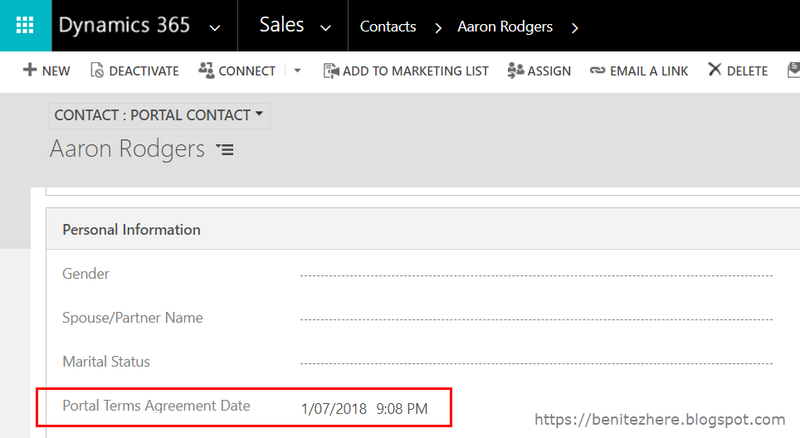 In the Contact record there is a field called "Portal Terms Agreement Date" which will capture the date and time the Contact accepted the terms and conditions. Terms and conditions can be displayed to users in Dynamics Portals to support the GDPR law. This was made available in preparation for the GDPR. This can all be done using configuration only. Steps are quite simple too. Check out the other features available from the release.